Welcome to Zagreb, Croatia’s lively Capital. You will be met at airport and transferred to your hotel. Included is a three-night stay in Zagreb. Today you will have an included guided of Zagreb. The tour will take you the main landmarks such as the Archbishop’s Palace, Opera House and Cathedral of St. Mark’s. Spend today at your leisure. Your Tour Director will be on-hand to help you plan your day. Welcome to Trogir, designated as a UNESCO World Heritage-listed site in 1997. Trogir is the perfect place to start any Croatian adventure, being a world away from the bustling big cities. This small isle town is set within medieval walls. Once you have settled into your sumptuous cabin on board the exclusively chartered MS Lastavica, perhaps enjoy a stroll along the seaside promenade as we dock centrally overnight. This morning one of our knowledgeable local guides will be taking you on a guided walking tour of Trogir, showing you how to navigate the maze-like marble streets and unveiling all of the best authentic cafés, while teaching you about the history of this magnificent town. This evening, enjoy traditional Klapa singers performing local songs on board with a glass of complimentary wine. Today, enjoy the enchanting North Dalmatian city of Zadar. In the morning, you will have a guided tour of Zadar’s old town, where Roman ruins and medieval churches sit snugly between cosmopolitan cafés and contemporary architectural achievements, including the first white marble Sea Organ in the world. After a relaxing morning spent admiring the views of the Adriatic coast, you will arrive in Rab. Most famous for its capital-in-miniature Rab Town, where red-roofed medieval buildings stand alongside four beautiful bell towers that spear skywards like masts from the ancient stone streets. After a guided tour of the island, enjoy an authentic tasting of famous Rab cake. This morning we will sail towards Telašcica Nature Park. This beautiful pocket of nature is known for being comprised of thirteen islands, islets and rocks, with a delightful scattering of peaceful bays, rugged cliffs and pre-Romanesque ruins. While one side of the park is covered in rich Mediterranean vegetation, the other is home to cultivated fields of vineyards and olive trees. This evening, enjoy a local wine tasting on board. 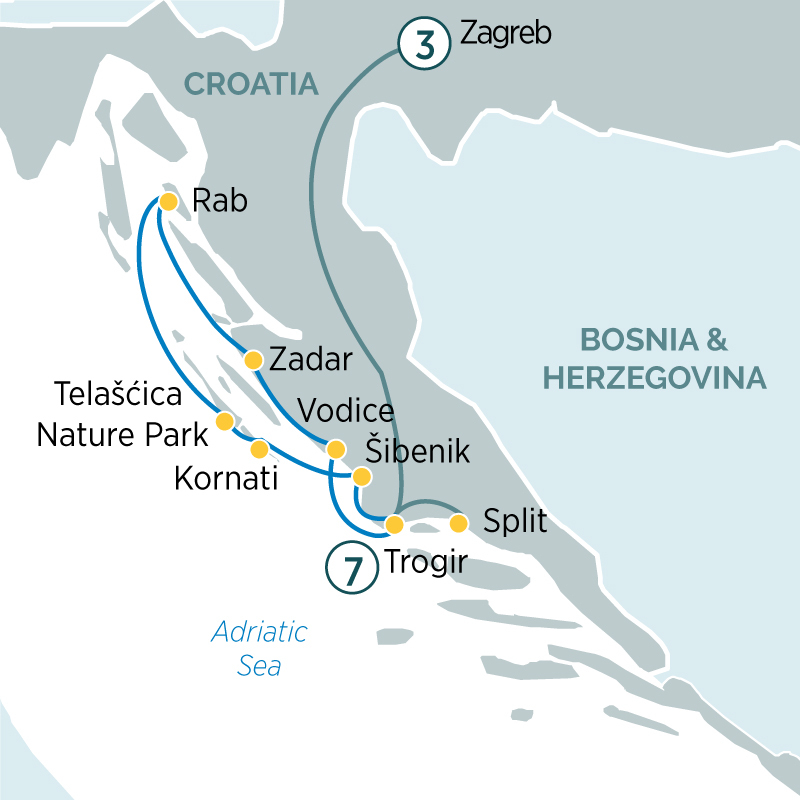 Croatia is full of awe-inspiring sights, but a cruise through the Kornati Islands, with their stunning uninhabited islets and reefs, will leave you with memories that you will treasure forever. This scenic archipelago has been protected as a national park since 1980. In the afternoon, we will arrive in Šibenik. Join your local guide for a guided tour of the city’s medieval heart, including the UNESCO World Heritage-listed St. James’ Cathedral. In the morning, you’ll sail back to the beautifully preserved town of Trogir. Once you arrive, enjoy a guided tour of Split, where a fascinating blend of Romanesque and contemporary architecture set alongside dramatic coastal mountain ranges is sure to inspire you. Once you have finished your breakfast, it will be time to say goodbye to your fellow guests as you prepare to transfer to Split airport for your homebound flight.